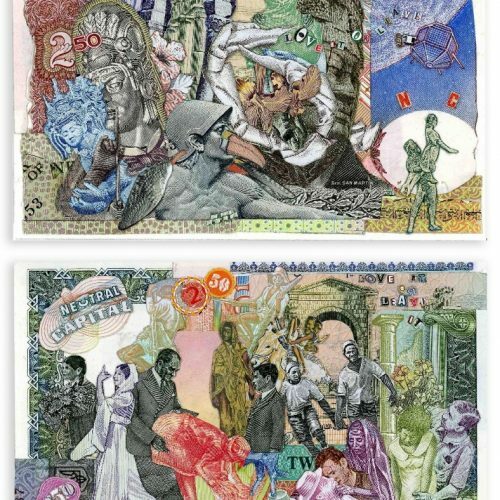 Neutral Capital 100, 2005,collaged currencies / also reprinted in ink on paper, 6 1/2 x 3 1/2” ea. 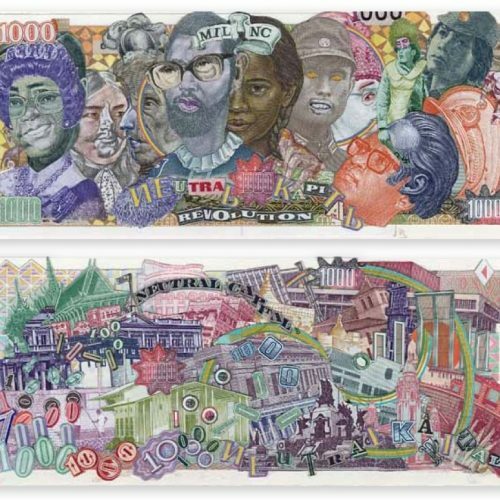 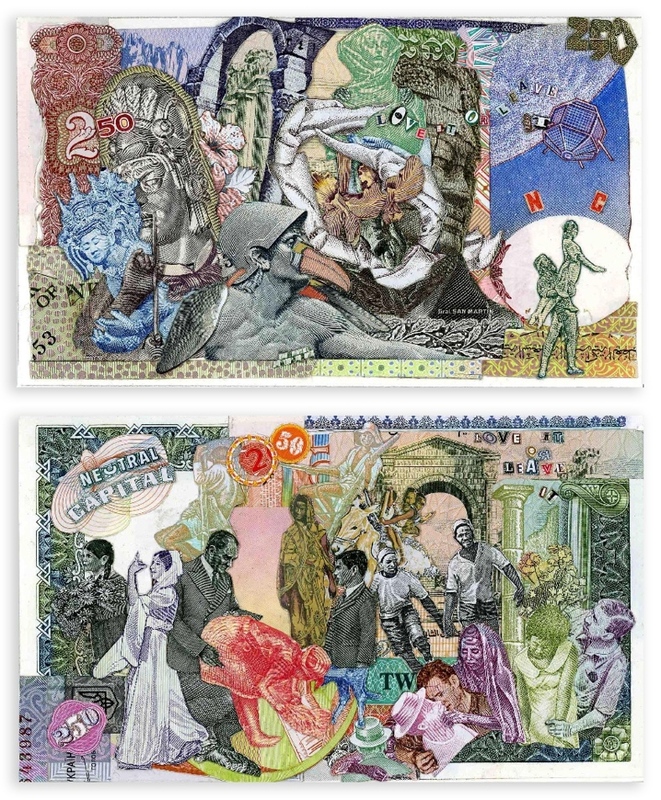 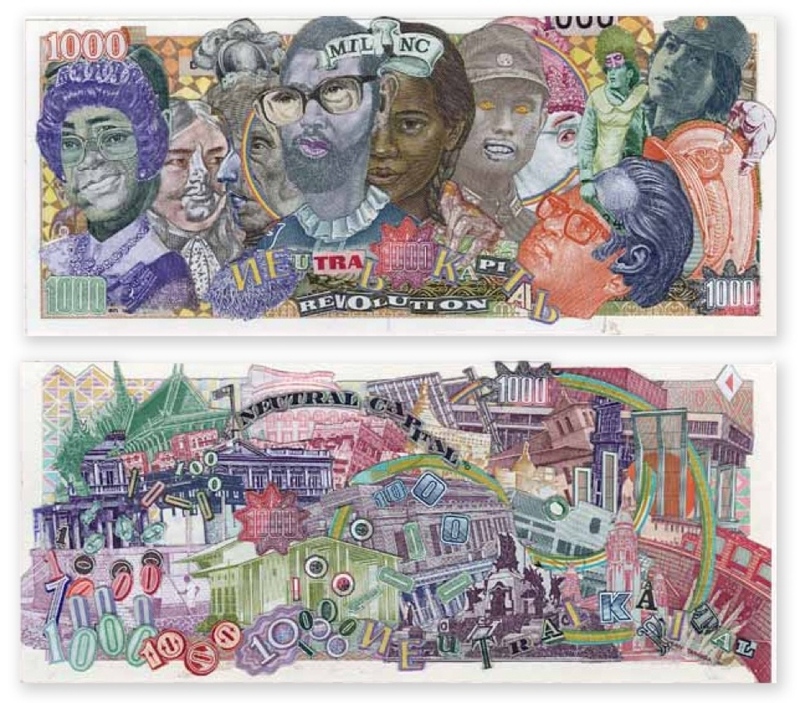 Neutral Capital 202 (Visionaries), 2005,collaged currencies / also reprinted in ink on paper, 7 3/4 x 3 3/4” ea. 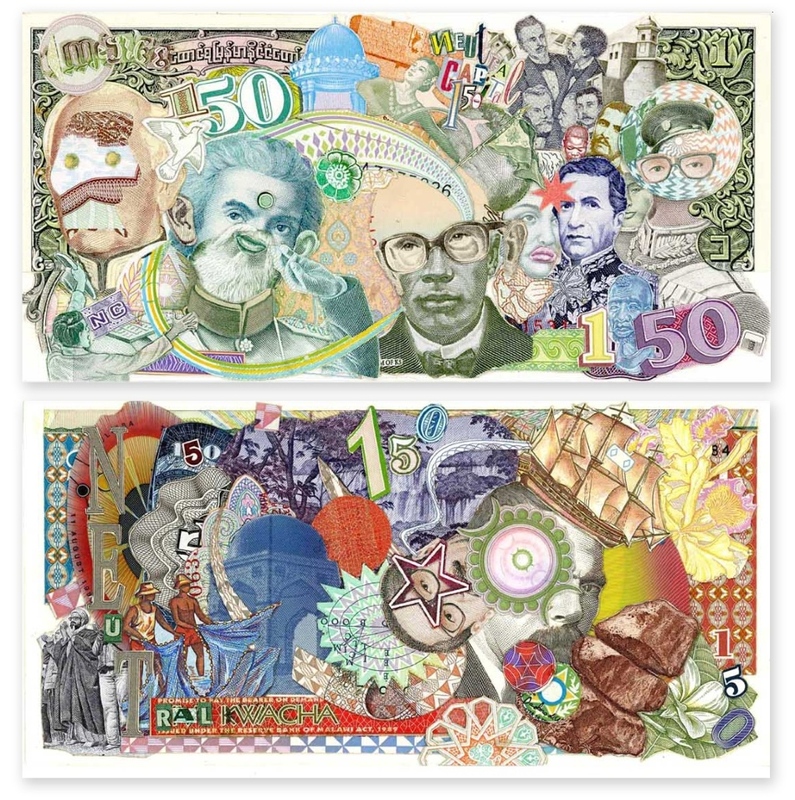 Neutral Capital 150 (ESP), 2006,collaged currencies, 7 3/4 x 3 3/4” ea. 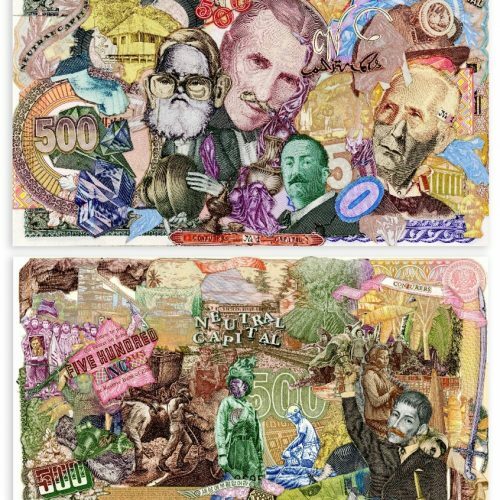 Neutral Capital 250 (Love it or Leave it), 2006, collaged currencies, 6 3/4 x 3 3/4” ea. 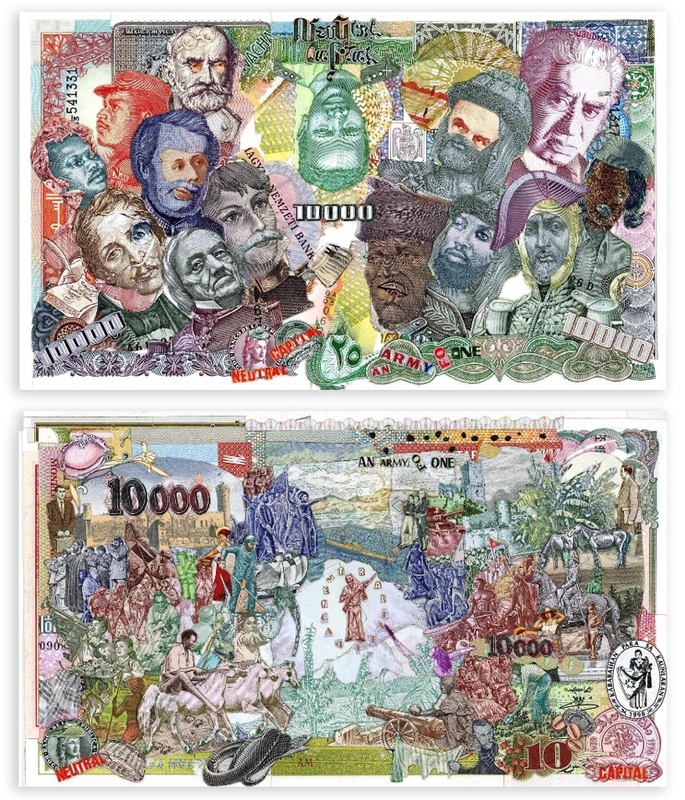 Neutral Capital 10000 (An Army of One), 2007, collaged currencies, 6 x 12” ea. 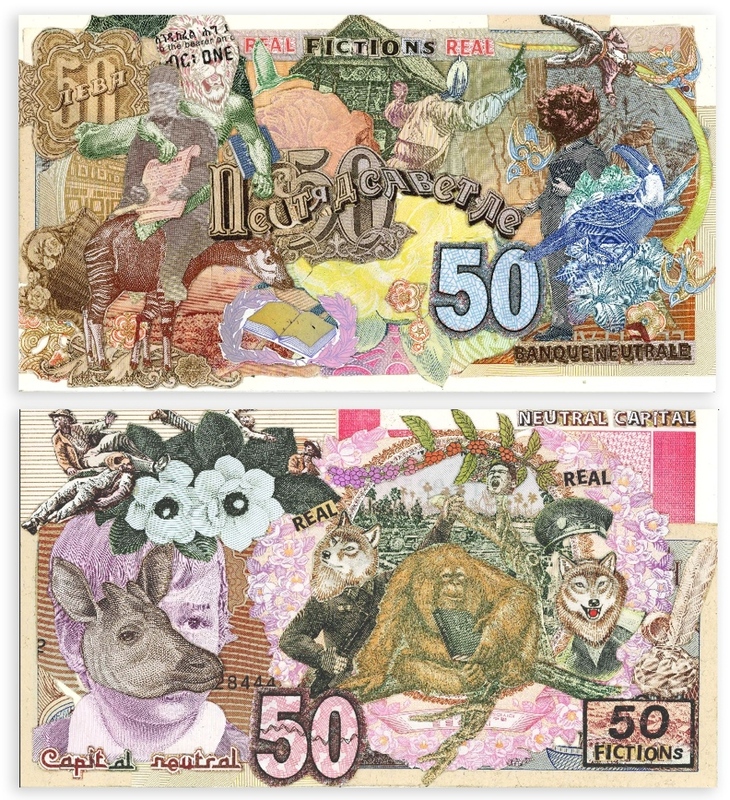 Neutral Capital 50 (Real Real Fictions), 2007, collaged currencies, 3 1/4 x 6 1/2” ea. 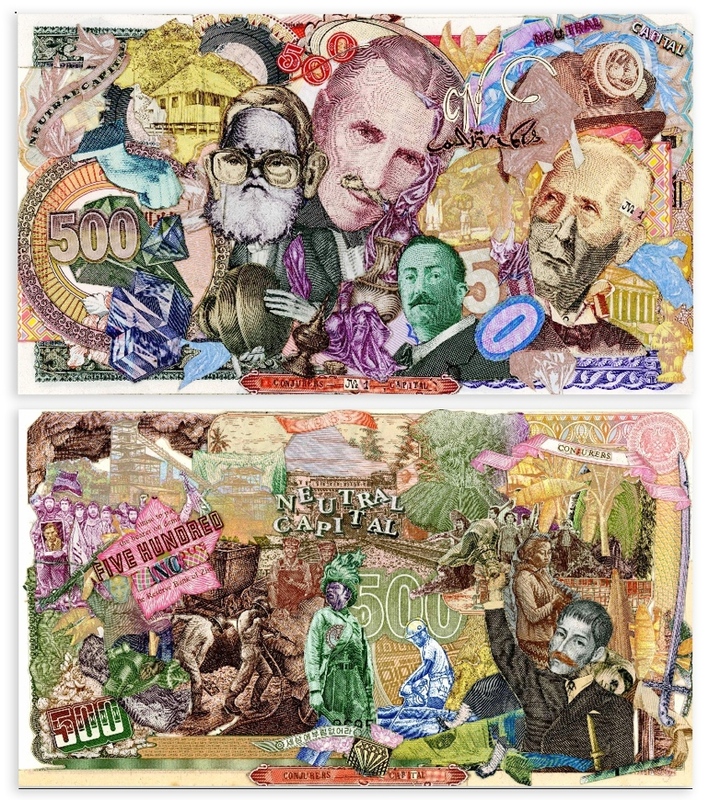 Neutral Capital 500 (Conjurers), 2008, collaged currencies, 4 1/2 x 7 3/4” ea. 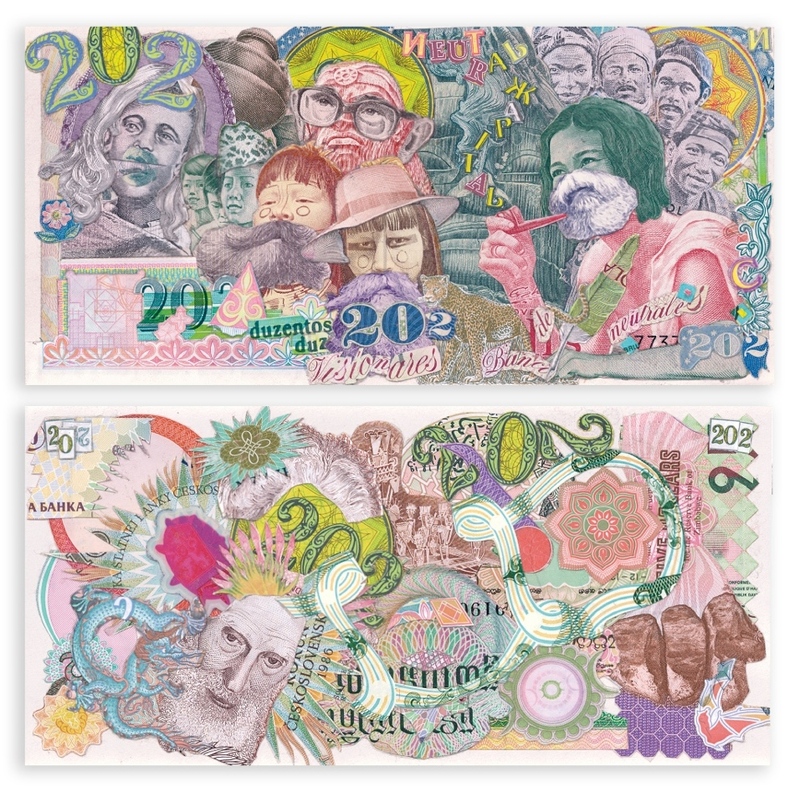 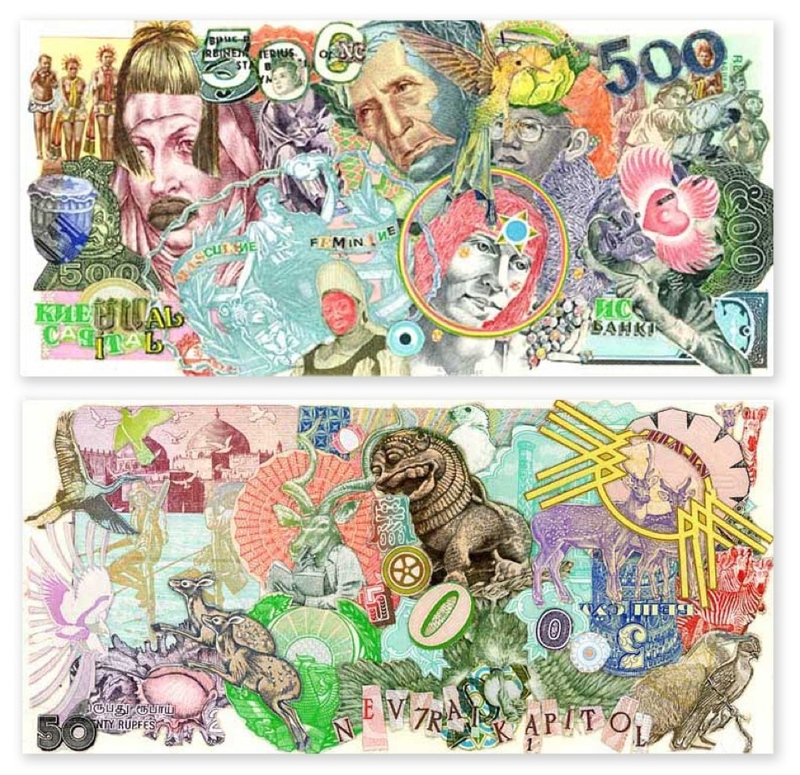 All Neutral Capital bills are collaged by hand from failed global currencies bought at market value, then printed in four color offset lithography. 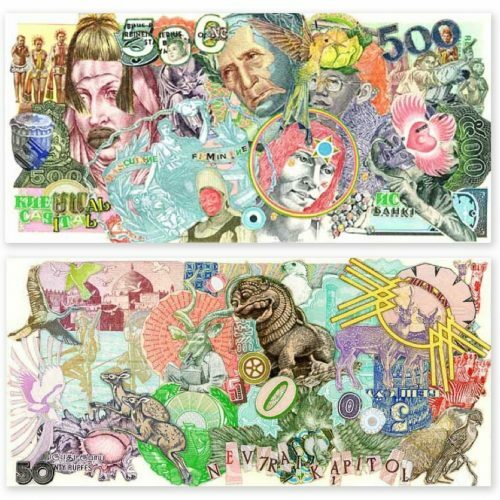 My process combines, reanimates and revalues these currencies to form an alternative market resource navigating art and commerce. 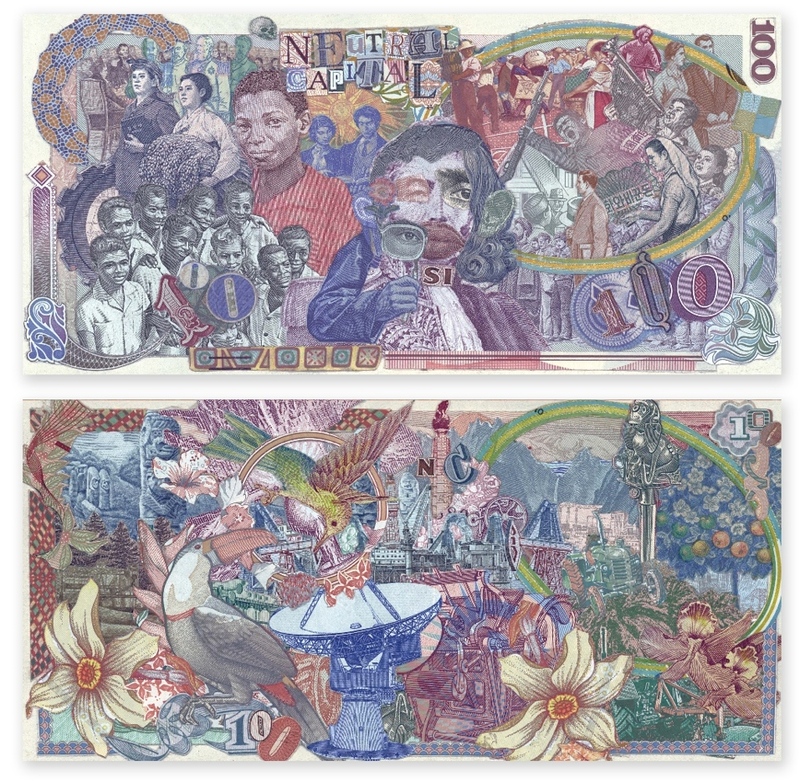 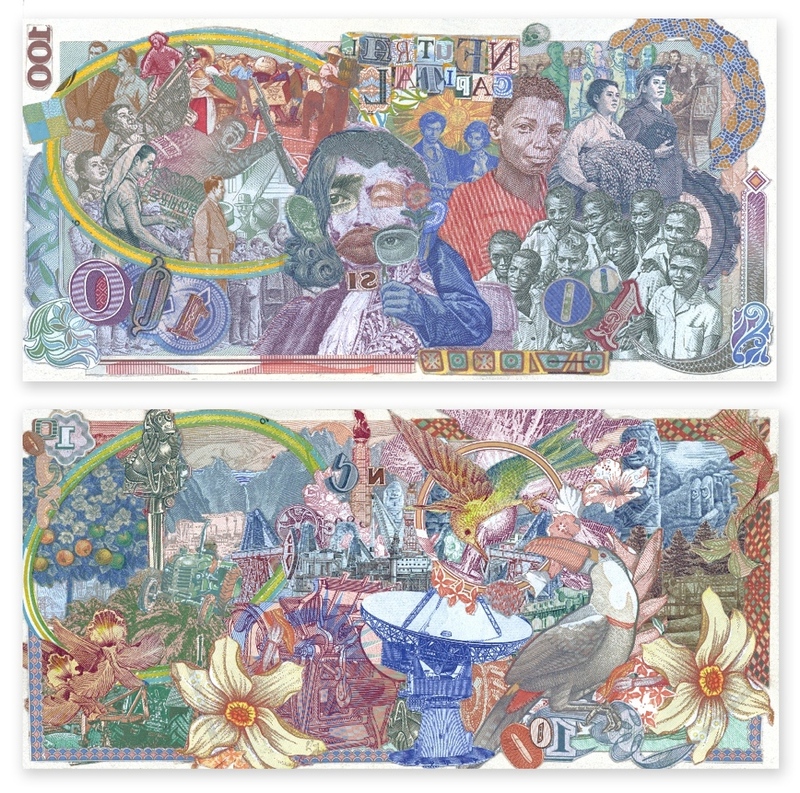 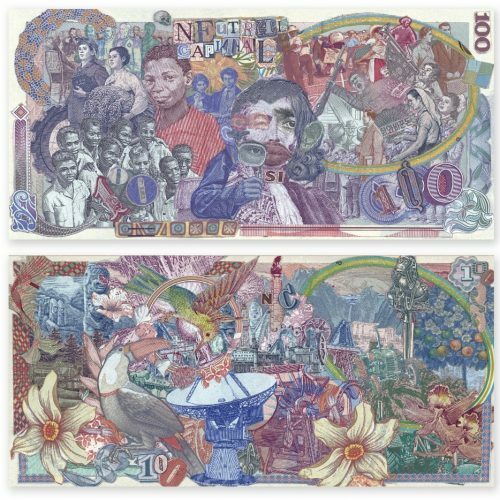 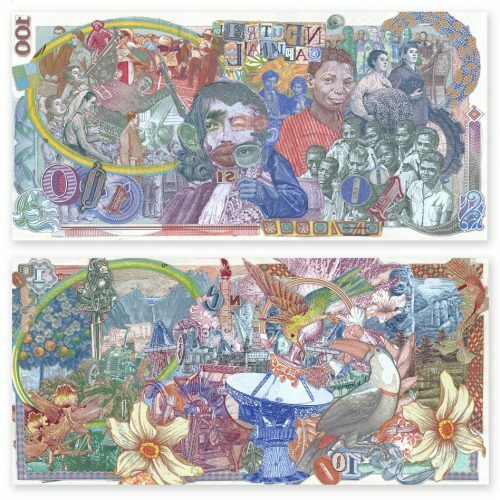 Each denomination is printed as a limited edition series and valued according to the daily exchange rate for Neutral Capital. 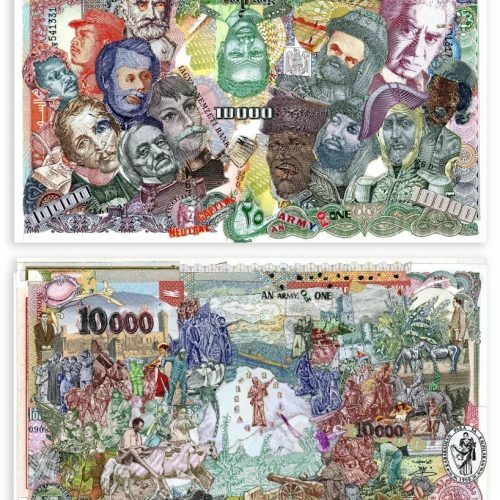 Each Neutral Capital series is designed around a theme illustrated in figures on the bills, a dramatic scene and elements of design. 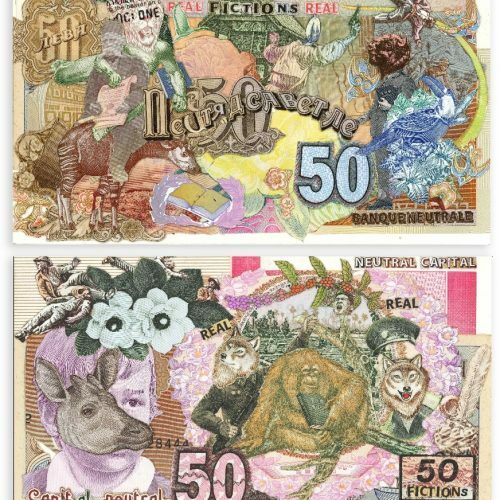 These include “revolution”, “visionaries”, “love it or leave it”, “army of one”, “masculine / feminine”, “e.s.p.”, “nature vs. industry”, and others.